A Chinese artist and activist, who is also active in architecture, curating, photography, film, and social and cultural criticism. Ai collaborated with Swiss architects Herzog & de Meuron as the artistic consultant on the Beijing National Stadium for the 2008 Olympics. He is most known now for his investigation and exposure of government corruption and cover-ups, especially the alleged corruption scandal during the construction of the Sichuan schools that collapsed in the 2008 Sichuan earthquake. He uses the internet to communicate with people all over China, especially the young. He uses theinternet to communicate with people all over China, especially the young.On 3 April 2011 police detained him, without laying any official charges for weeks, at Beijing airport. His studioin the capital was sealed off, and his staff interrogated pursuant to official allegations of "economic crimes". In November 2010, Ai was placed under house arrest by the Chinese police. He said this was to prevent the planned party to mark the demolition of his newly built Shanghai studio from taking place. In the end, the party took place without Weiwei's presence; his supporters feasted on river crab, an allusion to "harmony", and a euphemism used to jeer official censorship. Ai was released from house arrest the next day. On 3 April, Ai was arrested just before catching a flight to Hong Kong and his studio facilities were searched. A police contingent of approximately 50 officers came to his studio, threw a cordon around it and searched the premises. They took away laptops and the hard drive from the main computer; along with Ai, police also detained eight staff members and Ai's wife, Lu Qing. On 9 April, Ai's accountant, as well as studio partner Liu Zhenggang and driver Zhang Jingsong, disappeared, while Ai's assistant Wen Tao has remained missing since Ai's arrest on 3 April. Ai's wife said that she was summoned by the Beijing Chaoyang district tax bureau, where she was interrogated about his studio's tax on 12 April. The United States and European Union protested Ai's detention. The international arts community also mobilised petitions calling for the release of Ai: "1001 Chairs for Ai Weiwei" was organized by Creative Time of New York that calls for artists to bring chairs to Chinese embassies and consulates around the world on 17 April 2011, at 1 pm local time "to sit peacefully in support of the artist's immediate release. "Artists in Hong Kong, Germany and Taiwan demonstrated and called on Ai to be released. The Solomon R. Guggenheim Foundation and the International Council of Museums, who organised petitions, said they had collected more than 90,000 signatures calling for the release of Ai Weiwei. 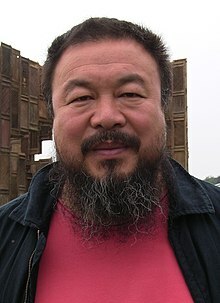 On 13 April 2011, a group of European intellectuals led by Václav Havel had issued an open letter to Wen Jiabao, condemning the arrest and demanding the immediate release of Ai Weiwei. The signatories include Ivan Klima, Jiří Gruša, Jáchym Topol, Elfriede Jelinek, Adam Michnik, Adam Zagajewski, Helmuth Frauendorfer; Bei Lin (Chinese:贝岭), a Chinese poet in exile drafted and also signed the open letter. On 16 May 2011, the Chinese authorities allowed his wife to briefly visit him. After the colloquy, Liu Xiaoyuan, his attorney and personal friend, reported that the wife had found the artist in good physical condition not held in a prison or hospital but in something she guessed. "...it’s a form of house arrest, under supervision." Furthermore there are news reports that Ai Weiwei has been receiving requested treatments for his pathologies (diabetes and hypertension). Leading Chinese activist and artist Ai Weiwei declared that China's government has no humanity -- and that the Communist Party is trying to silence anyone who disagrees with it. "They crack down on everybody who has different opinions -- not even different opinions, just different attitudes," Ai told CNN's Christiane Amanpour in an exclusive interview on Tuesday. "Simply to have different opinions can cost (dissidents) their life; they can be put in jail, can be silenced, and can be disappeared," he said. Ai is no stranger to controversy or danger. He helped design the iconic Bird's Nest stadium for the 2008 Beijing Olympics, but then called for a boycott of the games because in his opinion China was using them as propaganda. He also faced a barrage of official criticism in 2008 when he assembled activists to collect the names of thousands of unidentified students who were killed in the massive Sichuan earthquake. He also slammed local governments for allowing the construction of shoddy schools that collapsed. Ai has paid a heavy price for his dissent. He says he was beaten in a hotel room by Chinese police and later needed emergency brain surgery for injuries he suffered in the assault. Even as Ai spoke to CNN, Google appeared to be moving closer to leaving China in a showdown over Internet censorship and hacking from inside the communist nation. He filled Tate Modern's Turbine Hall with sunflower seeds and campaigned against corruption. Then last month China's most provocative artist disappeared.